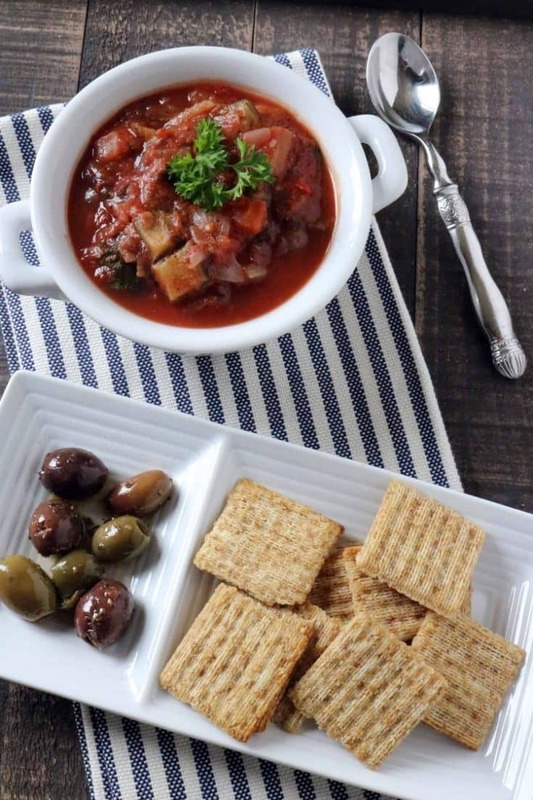 This recipe for Instant Pot Eggplant Caponata is the perfect appetizer for any occasion. 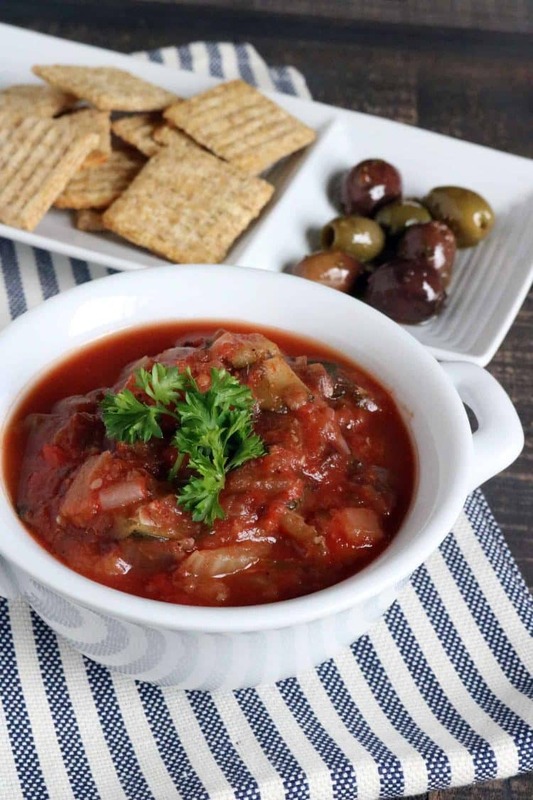 What makes it even better is the fact that you can make your eggplant caponata in your Instant Pot or other pressure cooker to speed up cooking time and allow the eggplant and other flavors to meld together until you have a perfect eggplant tapenade. Caponata is a traditional Sicilian eggplant dish spiked with vinegar for a kick and sweetened with a hint of sugar and dates (or sometimes raisins) to make for the perfect sweet and sour sauce. Eggplant caponata recipes vary by region and family to family with some incorporating capers, olives, pine nuts or raisins into the mix. The heart of the dish is the eggplant and the sweet and sour sauce. Does Instant Pot Eggplant Caponata Have that Weird Eggplant Texture? Not to worry! All the vegetables added to Instant Pot Eggplant Caponata are cooked together until tender and juicy, satisfying the most picky eater. Cooking your eggplant at high pressure in the Instant Pot takes away the weird spongy texture and lets the eggplant melt into the sweet and sour sauce. 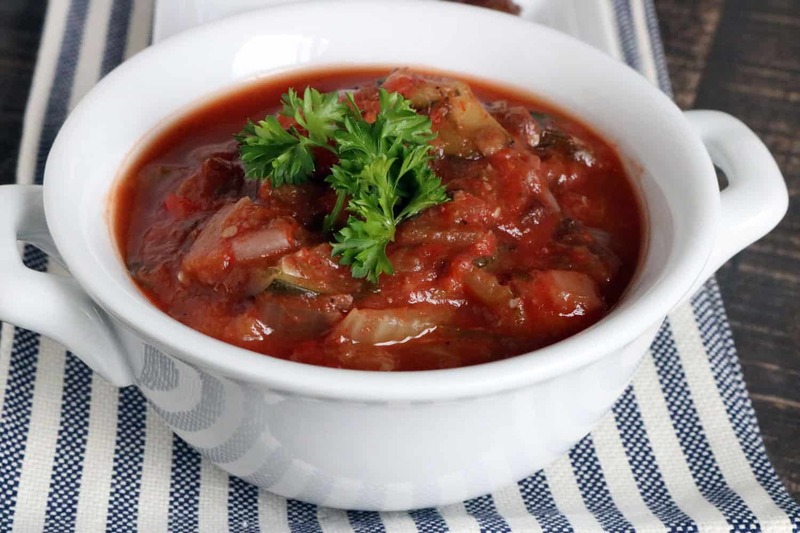 Start by gathering all your Instant Pot Eggplant Caponata ingredients and preparing your vegetables. 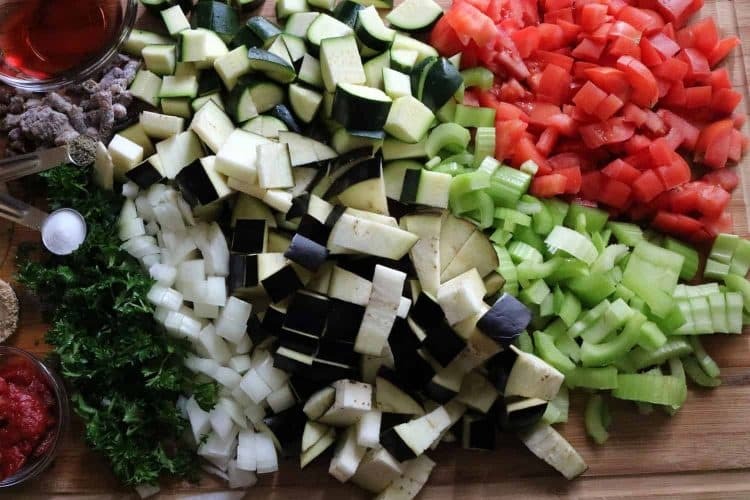 Chop the eggplant and zucchini into 1/2 inch pieces. 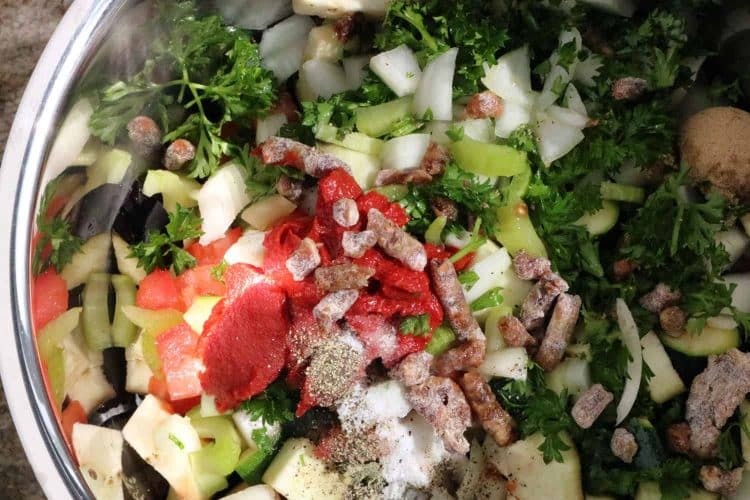 Dice the tomatoes, chop the onion, dates and parsley and slice your celery. This is by far the most labor intensive part of the dish, but once all the chopping is done you get to sit back and relax. Tip: Leave the skin on! Don’t worry about peeling the skin from your eggplant before cutting into 1/2 inch pieces. The skin has lots of nutrients and will soften and taste great once cooked. Place all of your prepared vegetables, dates and herbs into the Instant Pot. Add the red wine vinegar, brown sugar, 1/4 cup tomato paste, salt and pepper to the pot and stir everything together. Close the Instant Pot and set to pressure for 5 minutes. Once cooked use the quick release to remove the pressure. Once the pressure is released open up the pot and add the remaining 1/4 cup of tomato paste to the Instant Pot Eggplant Caponata. Stir in the added tomato paste until well combined. Now your Instant Pot Eggplant Caponata is ready to serve. 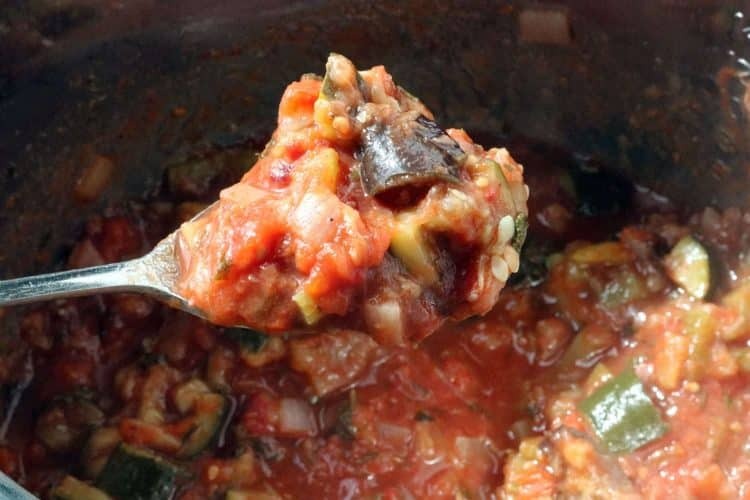 How Do I Serve Instant Pot Eggplant Caponata? Traditionally eggplant caponata is served as an appetizer with crostini, grilled polenta or the cracker of your choice. It tastes great warm, at room temperature and can even be served cold. If crostini and crackers are not your favorite feel free to add it to pasta, spread on a sandwich, spoon it over keto chicken, or even cook it with your eggs in the morning. Instant Pot Eggplant Caponata is a very versatile dish that gets better with age so feel free to make it a day or two ahead so the flavors can really meld together. 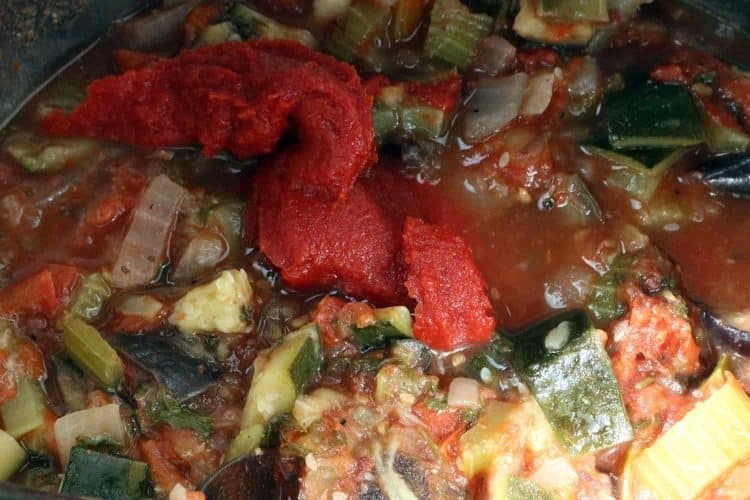 Eggplant and zucchini cooked in a sweet and sour tomato sauce. Add all ingredients to pressure cooker, reserving ¼ cup tomato paste. Set pressure to 5 minutes. Quick release and then stir in remaining ¼ cup tomato paste. Serve with a selection of crackers, flatbread, pita bread, and olives. Caponata sauce can be served warm or cold, and you can also serve with pasta or couscous.